When we think of sliders, the most immediate image that comes to mind is something along the lines of a miniature version of a classic sandwich. Something that resembles a bite-sized hamburger or pulled pork barbeque sandwich are likely the first examples that spring up. The folks over at Trader Sam’s Grog Grotto in the Polynesian Village Resort have some unique ideas when it comes to old favorites, and their sliders are no exceptions to this rule. The Roasted Chicken and Pork Pâte Báhn Mì Sliders don’t even sound like sliders, do they? Based in the Vietnamese art of sandwich making, báhn mì is a name given to just about any type of sandwich with a meat filling. The phrase báhn mì comes from the words for ‘wheat’ and bread,’ and was originally introduced to Vietnam through the French baguette. It is also worth noting that báhn mì has two spelling, the other being bánh mì, but that either form is acceptable. Since we’ve spent so much time talking about the bread, let’s start there. Like a baguette, the sliders come on bread that has been cut open from the top, with the meat and other fillings stuffed inside. The bread has a crispy and chewy crust, much like a baguette, with a soft flavorful inside. However, due to the bread’s unique shape, you will be eating quite a lot of the bread without the chicken, pork, or vegetables that reside mainly in the center of the sandwich. 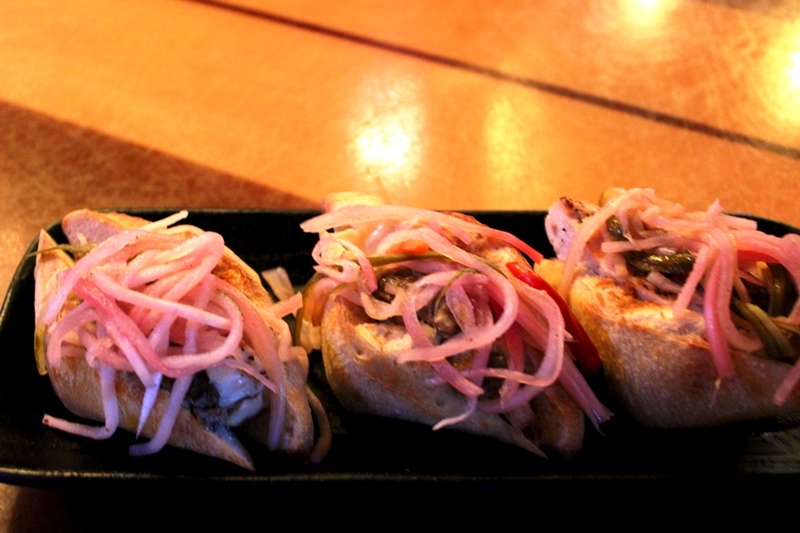 The two meat components of the sliders come straight from the title, roasted chicken and pork pâte. The chicken is good, with a nice mild flavor, but can be overpowered by both the pâte and the pickled vegetables. For its part, the pork pâte is rich and wonderful, and I’m not even a fan of pâte as a general rule. This is not your typical creamy pâte, but rather a more country version of the spread with healthy chunks of pork and fat. The remainder of the sliders is comprised of pickled carrots and onions, Thai chilies, and cilantro. These add some heat, an acidic bite, and even a hint of citrus from the cilantro. All of these components work well with the richness of the pork pâte, not trying to battle it for space on your taste buds, and lend some flavor to the underwhelming chicken. The Roasted Chicken and Pork Pâte Báhn Mì come three to a serving at Trader Sam’s Grog Grotto, and I would order them again. If pressed, I would wish for a little less bread and to give the chicken some extra punch, maybe a chili rub of some sort. However, the components work well enough together that I can’t find too much to complain about. This dish has also shed new light on just what it means to be a slider in Walt Disney World.